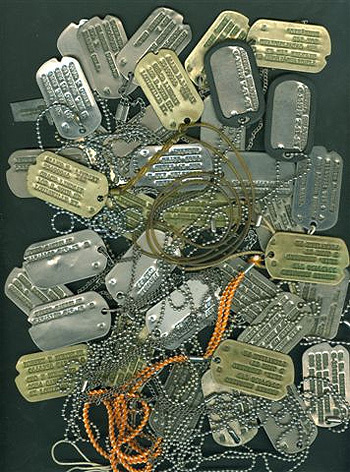 Grouping of “Dog Tags” illustrating different metal tags, necklaces, cords, and holders. 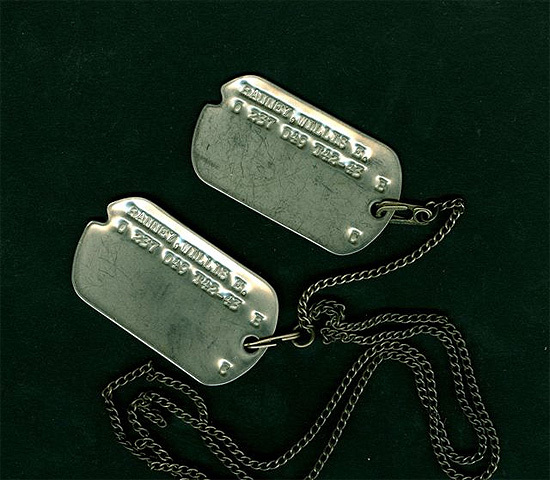 The Identification Tag was first introduced 20 December 1906 by General Order # 204, which described it as follows: … an aluminum Identification Tag, the size of a silver Half Dollar, stamped with the name, rank, company, regiment, or corps of the wearer; it will be worn by each Officer and Enlisted Man of the Army whenever the field kit is worn; it will be suspended from the neck, underneath the clothing by means of a cord or thong passed through a small hole in the Tag; it is further described as being part of the uniform…” This Identification Tag will be issued by the Quartermaster Corps, gratuitously to Enlisted Men ant at the cost price to the Officers. NECKLACE, IDENTIFICATION TAG, WITH EXTENSION – Stock No. 74-N-300 > official stocklist number adopted in 1943. Length 40 inches. 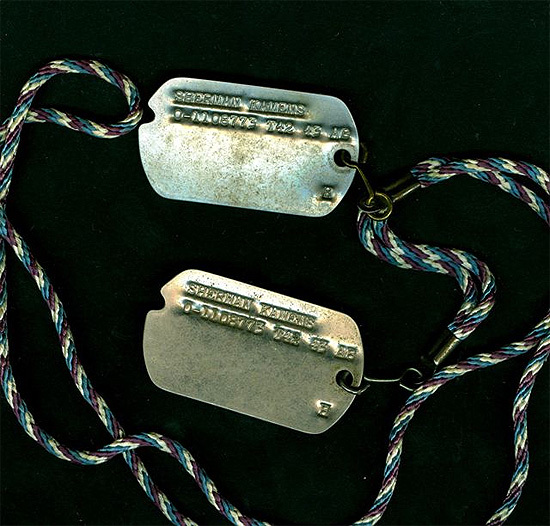 In 1942, the first tag is to be suspended on a necklace 25 inches in length, while the second tag is to be fixed to a separate necklace extension not further than 2 ½ inches under the first one – first models of tag holders were in cotton, plastic, nylon, rayon, the official “double-J” metal necklace was only introduced in 1943 (with hooks & catches) the bead type (initially sold at PXs) quickly became very popular and available in case of loss and gradually replaced the 1943 issue, it was made out of 2 lengths of stainless steel, of approximately respectively 28 inches and 6 inches in length, easy and practical for general use. TAG 2” X 1 1/8” > official dimensions: 2 inches (long) x 1 1/8 inches (wide) x 0.025 inches (thick). Rectangular form with notch at left (to position tag on the embossing machine) small rolled outer edges, and a single hole (dia 1/8″) for the necklace. Early types were manufactured in Monel and had a capacity for 5 lines of text, providing 18 spaces per line (ref. Cir # 151, AR 600-40, WD, 12 Dec 40). The official Dog Tag required the following information: Name, Service Number, Date of Tetanus Inoculation, Blood Type, Person to Notify, Religion. US Army Spec No. 34-18, dated 15 February 1939 called for production of a thin metal copper-nickel alloy identification tag (i.e. Monel). 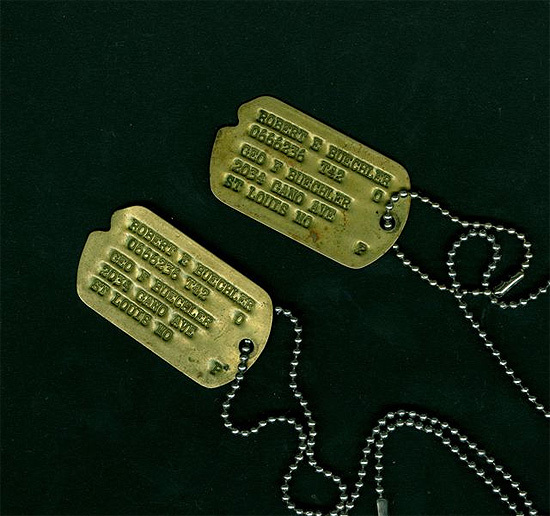 Because of the high content of copper, Monel Dog Tags had a yellow/brass color (due to wartime shortages, nickel-copper was sometimes used, whereby Monel tags looked more like ‘silver/white’ metal in lieu of yellow). Steel and stainless steel were also in use. As early as 1941 AR indicated that any member of the US Army was to wear the Identification Tags when in the field or on garrison duty. On 29 December 1942, the overall texts were amended to include that every soldier was to wear his Identification Tags even when dressed in civilian clothes (during passes or furloughs). Figure illustrating a grouping belonging to Regular Army Serviceman Sergeant Jennings D. Banner, ASN 17000575, Medical Department. 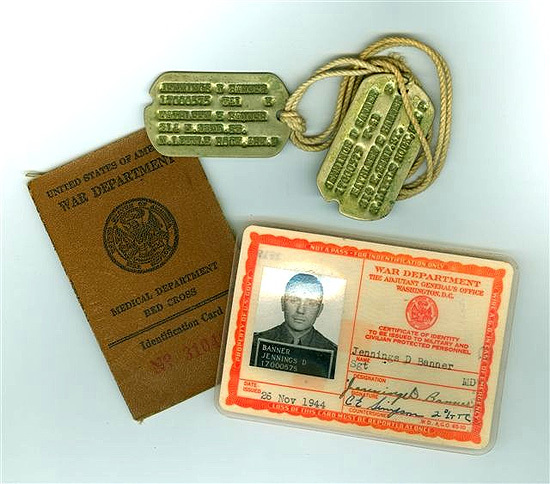 Included are his Monel Dog Tags held with a natural cotton cord holder, his US Army War Department, Medical Department Red Cross Identification Card (first pattern), as well as his laminated War Department Certificate of Identity to be Issued to Military and Civilian Protected Personnel (second pattern). Figure illustrating a Dog Tag belonging to Draftee Schultz, Wilbur H, ASN 38062988. Steel Dog Tag, fourth type, but still with address of next-of-kin, and necklace with hooks and catches. Figure illustrating a Dog Tag belonging to Draftee Moore, Thomas W., ASN 34890315. 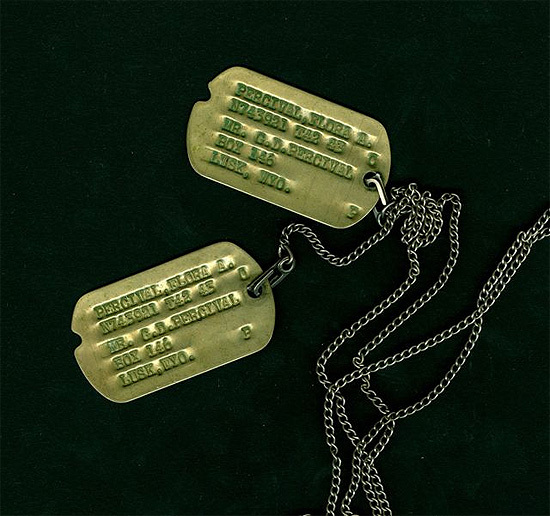 Steel Dog Tag, fourth type, with bead-type chain and Army Good Conduct + European-African-Middle Eastern Service Ribbons (with 2 miniature bronze campaign stars). Figure illustrating a Dog Tag belonging to Officer Harvey Melbourne H., ASN O-184747. 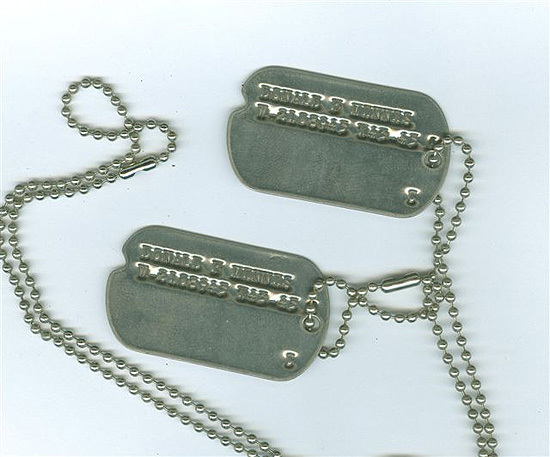 Stainless steel Dog Tag, fourth type, with bead-type chain, and black rubber silencers. Figure illustrating a Dog Tag belonging to Warrant Officer Sidney J Ashley, ASN W-2118309. Stainless steel Dog Tag, third type, with bead-type chain. Figure illustrating a Dog Tag belonging to Officer Robert E Buechler, ASN O666236. Monel Dog Tag, second type, with address of next-of-kin, and bead-type chain. Figure illustrating a Dog Tag belonging to Army Air Forces Flight Officer Oliver Ralph A, ASN T-6367. Stainless steel Dog Tag, fourth type, with bead-type chain. All serial numbers start with digits 20, while the third digit indicates Corps Area or Service Command (i.e. the area of Induction). The War Department allotted following blocks to members of National Guard units inducted into Federal Service. Figure illustrating a Dog Tag belonging to Army Nurse Corps Officer Percival, Flora A., ASN N743921. 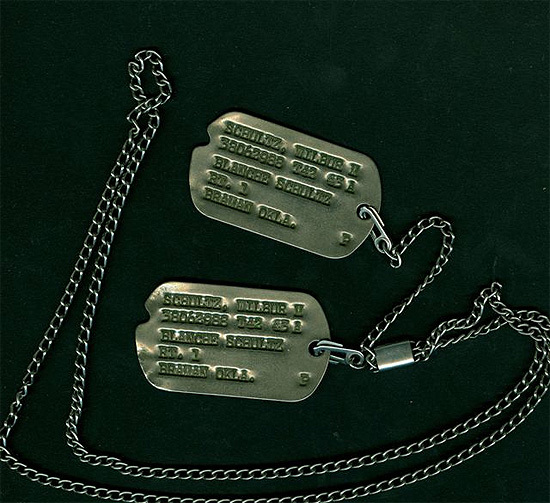 Monel Dog Tag, fourth type, with address of next-of-kin, and necklace with hooks and catches. 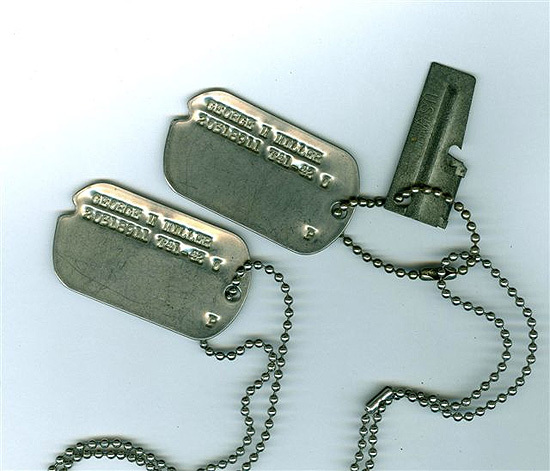 Figure illustrating a Dog Tag belonging to Hospital Dietitian Sylvia Plotkin, ASN R-418. Stainless steel Dog Tag, third type, with bead-type chain. Figure illustrating a Dog Tag belonging to Women’s Army Corps Officer Janet P Coleman, ASN L-918042. Stainless steel Dog Tag, third type, with bead-type chain. Here follow a number of remarks relating to various aspects of the use of Dog Tags throughout World War 2. Remark 1: religion P (Protestant) C (Catholic) H (Hebrew) in case the soldier had no specific religious preference, NO letter was printed. However non-regulation Tags exist indicating NP (no preference), N (no religion), or even O (other religion), such as GO, for Greek Orthodox). Jewish soldiers could elect to drop the H designation in the E.T.O., and leave a vacant space, or replace same with P, if preferred. Dog Tag silencers were introduced around the end of the war, in order to prevent clanking of the metal elements. There existed also special series for the Officer Reserve Corps (ORC) O-517501, National Guard O-502824, Officers (directly appointed from civil life) O-184747, Officer Candidate School (OCS) O-1287802, and the US Coast & Geodetic Survey (Army) Department (prefix K). 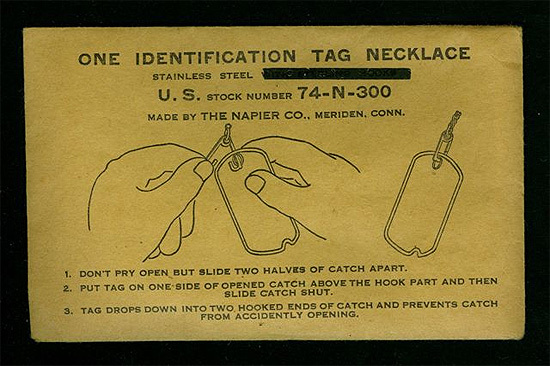 For Identification Tags, it should be noted that there were many changes due to temporary wartime shortages of strategic materials, involving production of these items in Monel, steel, and stainless steel. Figure illustrating a Dog Tag belonging to WAC Servicewoman Ethel McAlevy, ASN A-205333. Stainless steel Dog Tag, third type, with bead-type chain. Remark 2: due to the enormous increase in numbers of servicemen and women, the War Department was obliged to introduce additional blocks of numerals – furthermore some Service Commands inducted more than 1,000,000 men! Consequently, the W.D. launched a new series of digits in January 1943 for Draftees starting with prefix 4, immediately followed by the second digit indicating Corps Area/Service Command; as a result of this, the Second Service Command received a new series starting from 42,000,000 > 42,999,999, also the Third Service Command was allotted a new box ranging from 43,000,000 > 43,999,999, and so was the Fourth Service Command equally provided with another series of numerals starting from 44,000,000 > 44,999,999! Apparently the Sixth Service Command also received an additional series, i.e. 46,000,000 > 46,999,999 … This explains the introduction of series starting with digit 4. We encountered several samples i.e. servicemen with ASN 42007894, ASN42076794, ASN 42084227, ASN 42143972 – first digit 4 pointed to a new series introduced for Draftees, while digit 2 indicated the man originated from the Second Service Command/Corps Area … and more Draftees with ASN 43017476 were found from Third Service Command … as well as some indicating ASN 44016202, ASN 44031392, ASN 44035925, and ASN 44160430 … from the Fourth Service Command. Figure illustrating a Dog Tag belonging to Draftee Lorin E. Hubley, ASN 31130734. Stainless steel Dog Tag, third type, with cotton cord holder (plse note differences and non-regular abbreviations). Remark 3: after WW1, a first prefix letter was to become standard from 28 March 1919, this was introduced for WW1 Veterans with an ASN lower than 6,000,000 who re-enlisted, such as ASN R56595, R316459, ASN R1239164, ASN R2376621, ASN R5422378 (highest number recorded in WWI was 5,996,630). When recruiting was resumed, a box starting from 6,000,000 was introduced – it applied to Volunteers signing up for Regular Army service as from 1 March 1919, with a numbering going further upward to 7,070,199 which was the last number applicable on 30 June 1940. The large increase in Army personnel (due to measures, such as calling up the National Guard for Federal service, and the number of Reserve Officers and Selective Service Trainees, becoming available) called for new ‘boxes’ of Serial Numbers to be introduced (numbering up to 8 digits). However, ALL military personnel already having an Army Serial Number prior to 1 July 1940 were to retain their current ASN (numbering 7 digits only). It should be noted that Volunteers with ASN starting with digit 6 would have been older than the average Volunteer and/or Draftee, inducted at the outbreak of World War 2! Sofar, I’ve come across quite a number of these particular Dog Tags (such as ASN 6047961, ASN 6142278, ASN 6282652, ASN 6546135, ASN 6614153, ASN 6714785, ASN 6800169, ASN 6954193, ASN 6999329, and also found numbers such as ASN 7000141, ASN 7002613 and ASN 7040347). Figure illustrating a Dog Tag belonging to Reserve Corps Officer R H Gallaher Jr., ASN O-517501. Stainless steel Dog Tag, third type, with bead-type chain. 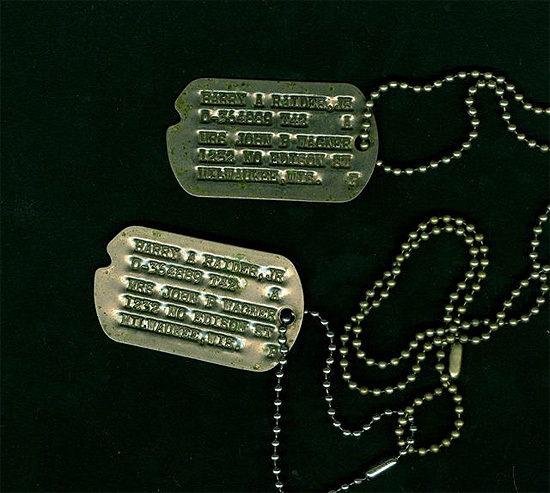 Remark 4: about brass Dog Tags; in December 1940, the Army had to make a choice between brass or Monel – they chose the latter (stronger alloy with copper & nickel content) because nickel was on the list of critical items. Brass was used as a substitute standard in mid 1941, but by the end of 1942 due to a large growth of the US Armed Forces, there was a shortage of both brass and Monel, and now also brass was on the list of critical items; so the Army had to look again for another solution, and thus by end March of 1942, stainless steel became the substitute material. Although steel was also on the critical war material list, it was somehow still available in fairly larger numbers (as compared to some other raw materials) for other applications like Dog Tags! Because of the continuous evolution in war industry, material shortages of different metals and/or metal alloys appeared on several occasions, whereby the Army still issued smaller lots of steel and Monel Identification Tags (quantities still available in some depots), this variety in production only stopped end 1943 – early 1944, when production reverted only to stainless steel! (let’s not forget that by May 1945, the Army numbered over 8 million men and women). 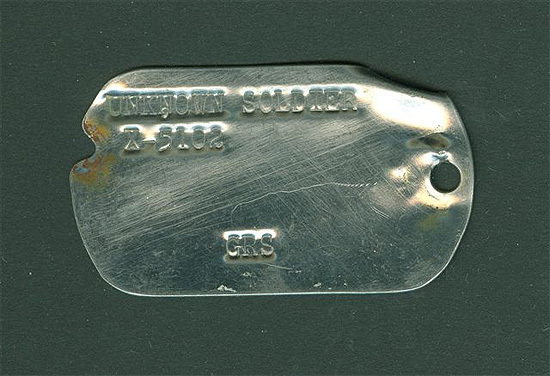 Figure illustrating a Dog Tag belonging to Officer Sherman Kamens, ASN O-1108773. Steel Dog Tag, third type, with braided colored rayon holder. Remark 5: the A.R.C. (American Red Cross) through its millions of Volunteers provided comfort and aid to members of the Armed Forces and their families, they served in ZI Hospitals suffering from severe shortages of medical staff, produced emergency supplies for war victims, collected blood, money, scrap, and ran Victory Gardens, they further maintained training programs in home nutrition, first aid and water safety. Overseas, American Red Cross workers served as Field Directors and Staff Aides or Workers providing compassionate and moral support for the troops they accompanied, while women mostly operated Clubs & Canteens and traveling Clubmobiles (‘Donut Girls’), where they acted as social workers and arranged for recreational programs. As Nurses they were actively attached to Military Hospitals, Hospital Ships, and Hospital Trains! Although wearing different uniforms and insignia, A.R.C. personnel did however wear regular Army Identification Tags! The authors have not been able to find out whether specific numbers (or boxes) were allotted to the A.R.C., but what we do know is that, for the second line, they used prefix ARC, followed by a number of numerals, such as ARC 28774 and ARC 41350 (preceded by standard data i.e. first name, second initial, surname + tetanus immunization + blood type + religion). USO personnel, War Correspondents, Photographers, Specialists, and Civilians working for or accompanying the Army also had to wear ID Tags (but the authors haven’t been able to find anything on the subject). 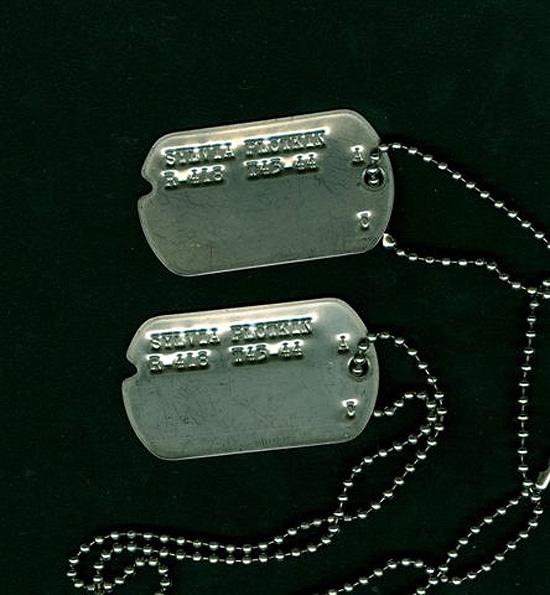 Civilians sometimes received Dog Tags with the designation DAC (Department of the Army Civilian), US NATIONAL, or the Army Branch they were attached to (SIG CORPS, ORD CORPS) they however were not assigned Army Serial Numbers. 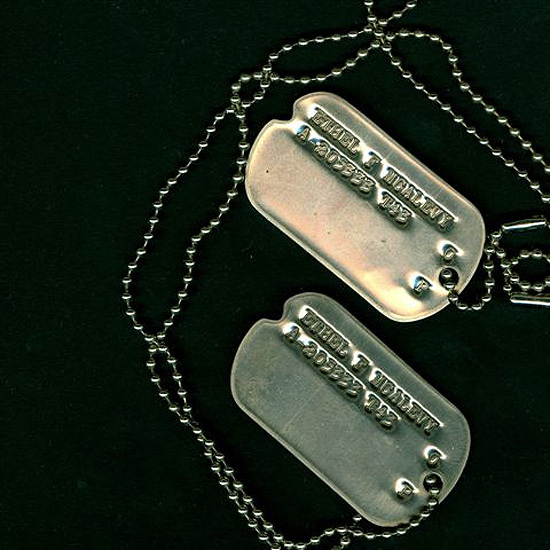 Figure illustrating a Dog Tag belonging to Officer Harry A Raider, Jr, ASN O-364889. 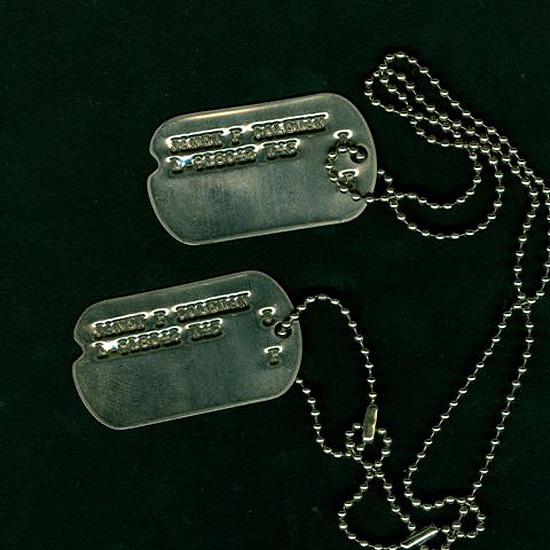 Steel Dog Tag, second type, still with address of next-of-kin, and with bead-type chain. 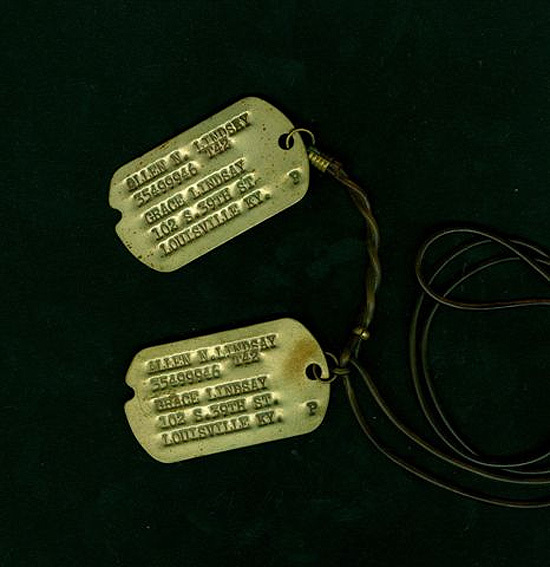 Figure illustrating a Dog Tag belonging to Draftee Allen N. Lindsay, ASN 35499946. 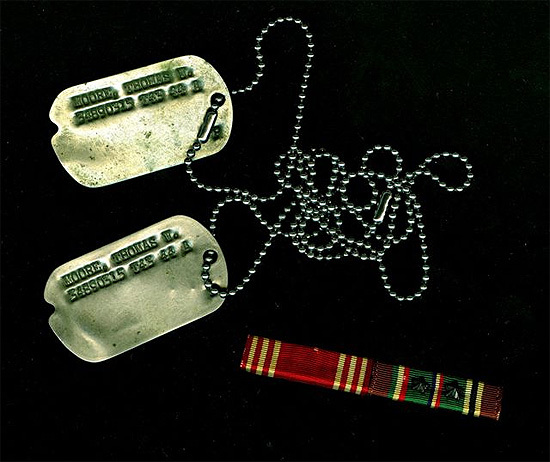 Monel Dog Tag, first type, with address of next-of-kin, and clear plastic/nylon cord holder (please note Tetanus indication added later, unproperly aligned, and the lack of blood type indication). Remark 7: towards the end of 1967, the Army announced its intention to drop the use of Army Serial Numbers! Between 1967 and 1969, before switching to Social Security Numbers, most Identification Tags had both indications, i.e. ASN + SSAN! Finally ASNs were dropped June 30, 1969, and as such the new data (on Dog Tags) looked as follows: 1st line = SURNAME, 2d line = FIRST NAME + INITIAL, 3d line = SOCIAL SECURITY ACCOUNT NUMBER, 4th line = BLOOD TYPE + RHESUS FACTOR, 5th line = RELIGION. Although the Rhesus factor was already discovered in 1940, its indication was only introduced after World War 2 (blood types embossed on the Identification Tag during the war period included: A – AB – B – O). Figure illustrating a Dog Tag belonging to Officer Ranney, Willis E., ASN O 237 049. Stainless steel Dog Tag, fourth type, and necklace with hooks and catches (please note the irregular spaced ASN numerals). Figure illustrating a grouping belonging to Draftee Charles E McClure, ASN 42033953. 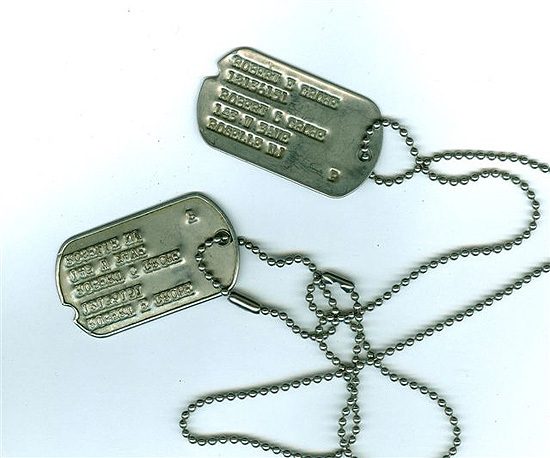 Included are his pair of stainless steel Dog Tags, third type, with bead-type chain, key, Army Good Conduct Medal with additional ribbon, and identification bracelet. This particular soldier received an ASN that is part of an extra block of numerals allotted to the Second Service Command (please see Remark 2). Remark 9: a ‘special’ Tag was used by the Graves Registration Service (QMC), when it proved impossible to determine the identification of an unknown soldier. In cases of group or individual casualties, either in aircraft crashes, burned tanks, or water casualties, where positive evidence of individual identities were completely lost and only group identities could sometimes be determined by organization lists showing the crew complement, it was possible occasionally to separate and preserve the individual remains of one or more and, in some instances, all the members of a same crew. When Identification Tags were missing, and all evidence of identification had been completely destroyed by fire or otherwise, bodies had to be definitely marked UNKNOWN, with designation X-6, or X-45, etc., i.e. the numeral assigned to the first body being the next serial number to the last UNKNOWN X-(number) remains already buried in the temporary cemetery where the remains were to be interred. The Grave Marker was then to be marked with an embossed plate, i.e. a substitute Tag, with the following data: UNKNOWN SOLDIER and X-5102 followed by GRS. (when enemy dead were found, either identified or unknown, the available data were embossed on such provisional Tags preceded by the word GERMAN). Figure illustrating a Dog Tag belonging to Regular Army Serviceman Robert E. Grohe, ASN 12136151. 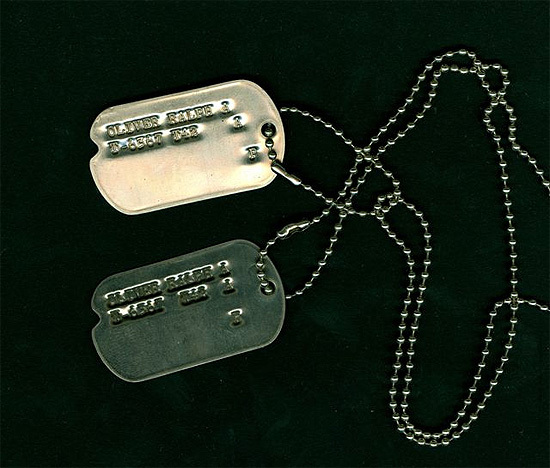 Steel Dog Tag, third type, with bead-type chain (please note this Tag misses a blood type indication). Figure illustrating a Dog Tag belonging to Warrant Officer Donald F Minnis, ASN W-2108945. Stainless steel Dog Tag, third type, with bead-type chain. Dog Tag example: Clarence R. JONES 37337566 can be identified as being a draftee (digit 3) originating from Seventh Corps Area (digit 7); this soldier (fictitious identity) could have hailed from one of the States i.e. Arkansas, Iowa, Kansas, Minnesota, Missouri, Nebraska, North Dakota, South Dakota, Omaha within Seventh Corps area, falling under the jurisdiction of the Fourth United States Army. 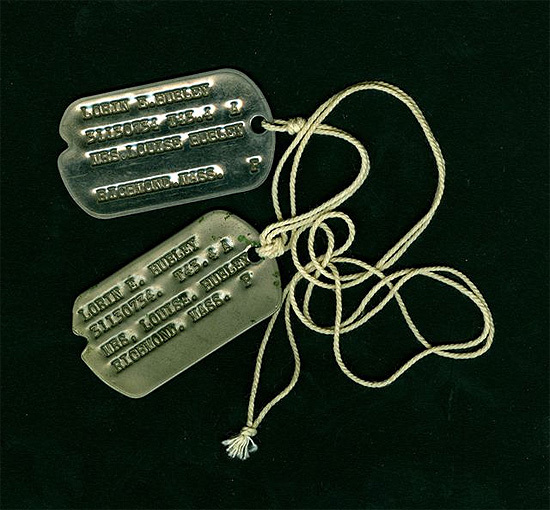 Figure illustrating special Dog Tag issued by the Quartermaster Graves Registration Service and placed on a grave marker to designate an “unknown soldier”. Stainless steel Dog Tag, with specific indication, sequence number of unknown grave, and GRS reference (please see Remark 9). Notes: The Quartermaster Corps is charged with the storage and issue of Identification Tags and embossing machines for use therewith – the Medical Department is charged with the storage and issue of machines for transcribing entries from Identification Tags – machines for transcribing data from Identification Tags, complete with instruction books, will be issued to such personnel of the Medical Department, as may be designated by The Surgeon general (ref. Circular N°151, 3 December 1940) above was necessary, since the Medical Department was responsible for registration of vaccine inoculation and blood type. Tags: main supplier of ‘Monel’ tags, H. K. Metal Craft Mfg. Co., New York, U.S.A. (early type of identification tag). Another supplier was H. L. Judd Company, Inc., Wallingford, Connecticut. 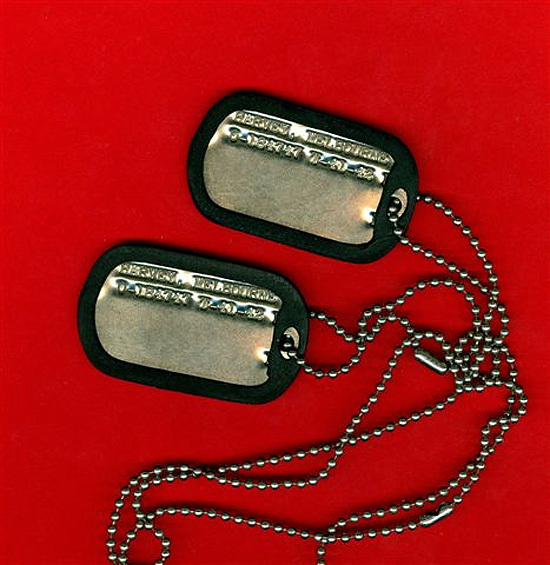 Figure illustrating two paper envelopes containing Dog Tags and Chains. Left: paper envelope containing M-1945 stainless steel blank tags (without rolled edges) made in England and destined to replace lost or missing Identification Tags. Right: paper envelope containing a spare bead-type chain for connecting Dog Tags, manufactured by The Bead Chain Mfg. Co., Bridgeport, Conn., U.S.A.
Necklaces: main suppliers, The Napier Co., Meriden, Connecticut, U.S.A., Sweet Manufacturing Company, Attleboro, Massachusetts, U.S.A. (traditional chains with hooks & catches); The Bead Chain Mfg. Co., Bridgeport, Connecticut, U.S.A. (bead-type chain with coupling). It must be noted that variations in metal existed. Some necklaces were made out of Monel, steel, sterling silver, or stainless steel; chain links were larger, some beads were smaller or larger in size. Cords were produced in clear plastic, rayon, cotton, nylon, or cloth tape. Colored cords were available too, matching the arms of service. Commercial types of tag holders were supplied by various manufacturers, so there was a real plethora of supplies available to the G.I. 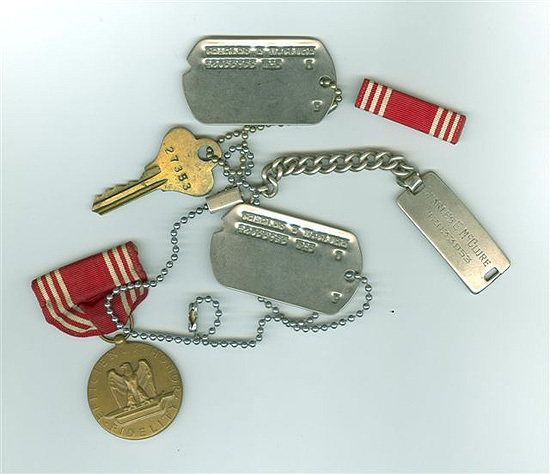 Figure illustrating commercial issue carton with Identification Tag Chains for Servicemen. This particular example consists of a Sterling chain with connectors and locking hooks to hold 2 Dog Tags. Printing Machines: “Graphotype” hand-operated embossing machine: Army Stock N° 54-M-29055; “Graphotype” hand-operated embossing machine: Army Stock N° 54-M-29055-50; “Graphotype” motor-operated embossing machine: Army Stock N° 54-M-29065; and “Adressograph” pistol-type imprinting machine: Model 70, Medical Department Item #99387. Main supplier: Addressograph-Multigraph Corp., Cleveland, Ohio, U.S.A. Storage & Distribution: As per Section II, Circular No. 151, dated 3 December 1940 the Quartermaster Corps was charged with the storage and issue of Identification Tags (aka Dog Tags) and Embossing Machines for use therewith. The US Army Medical Department was charged with the storage and issue of Machines for transcribing entries from Identification Tags (i.e. the Model 70 Addressograph Imprinting Machine, Pistol Type). Embossing Machines, complete with instruction books, were issued without requisition to US Army Reception Centers and Machine Record Units. As it was impracticable to supply the machines to ALL Posts, Camps, Bases, and Stations, Corps Area, Corps Department and Field Force Commanders were to make arrangements with the Machine Record Units (under the jurisdiction of The Adjutant General Department) servicing their respective Commands for the embossing of Identification Tags for all personnel under their jurisdiction for whom Tags had not been provided at the Reception Centers. Machines for transcribing data from ID Tags (i.e. 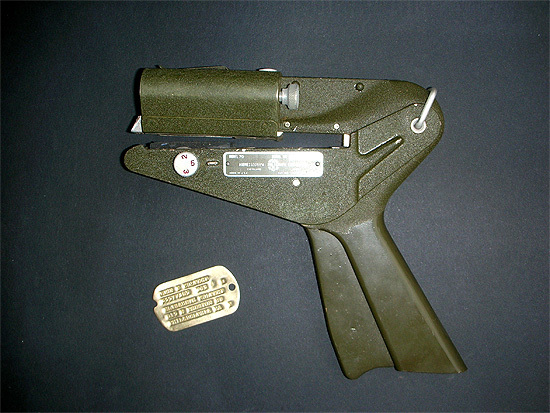 the Model 70 Addressograph), complete with instruction books, were to be issued without requisition to such personnel of the US Army Medical Department as designated by The Surgeon General. 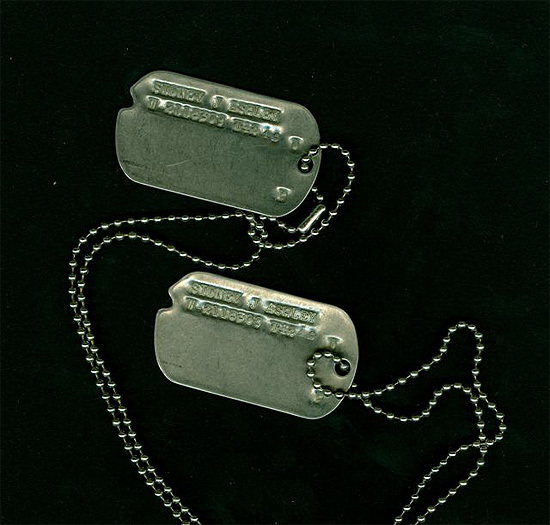 Individual responsibility for distributing and replacing Dog Tags in overseas Theaters rested with the S-1, G-1, or A-1 Personnel Sections of the unit requesting Identification Tags. They then contacted the higher authority to obtain the necessary materiel. As indicated and illustrated in our MRC Article, the QMC had stocks of available “blank” tags, either supplied from the US or manufactured in the United Kingdom (under Reverse Lend-Lease contracts). 1940 Selective Service Act: Act passed by Congress September 14, 1940, authorizing registration for military service in the Armed Forces of the U.S., of all men in the United States between the ages of 21 and 35 inclusive. It was later extended to include men between 20 and 44; and for non-military service, men aged 18 and 19 and men between 45 and 65 inclusive. 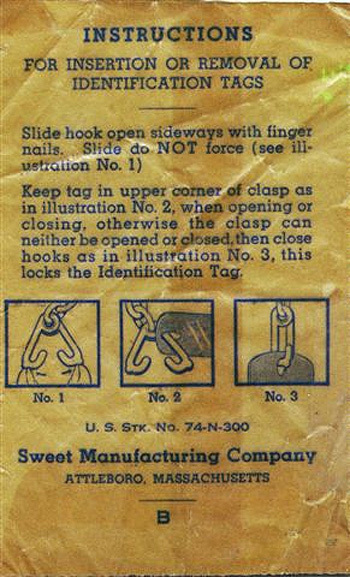 Figure illustrating official issue envelope for one Identification Tag Necklace. 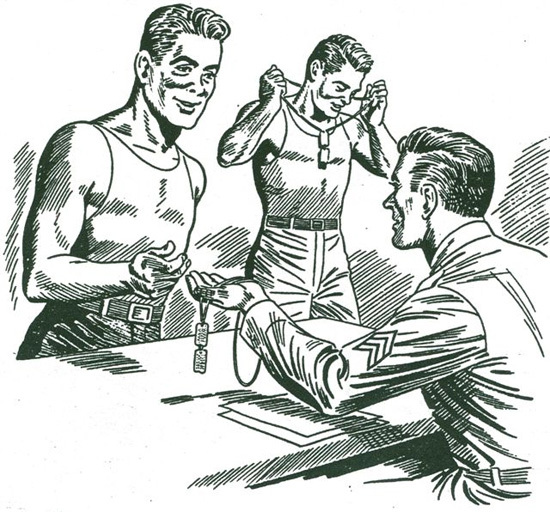 The chain consist of stainless steel links with sterling hooks and catches, manufactured by The Napier Co., Meriden, Conn., U.S.A.
War Department Pamphlet 21-13, Army Life, 10 August 1944 states… Always wear your Identification Tags. These are considered part of your uniform, and your Officers may ask you to show that you are wearing them at any time on or off the Post… AR 600-40, Section III, 31 March 1944 further indicates… Identification Tags will be worn by each member of the Army at all times and may be removed temporarily ONLY as the necessities of personal hygiene may require; one Tag is to be suspended from the neck underneath the clothing by a 25-inch non-corrosive, non-toxic, and heat-resistant material looped to form a necklace, and the second Tag fastened to the necklace below the first Tag by a 2 ½-inch extension of material similar to the necklace (introduced 29 December 1942). 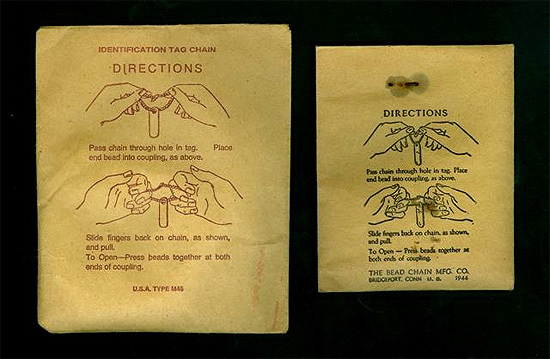 The Tags, embossed as provided in AR 600-35, Section VI, will be issued to each member of the Army as soon as practicable after entry intoservice… War Department Circular N° 262, 19 December 1941, stipulates… one Tag to be suspended from the neck underneath the clothing by a cord or tape 40 inches in length passed through the small hole in the Tag, the second Tag to be fastened about 2 ½ inches above the first one on the same cord or tape, both securely held in place by knots, in use till 28 December 1942. Figure illustrating commercial issue envelope for one Necklace for Identification Tags. 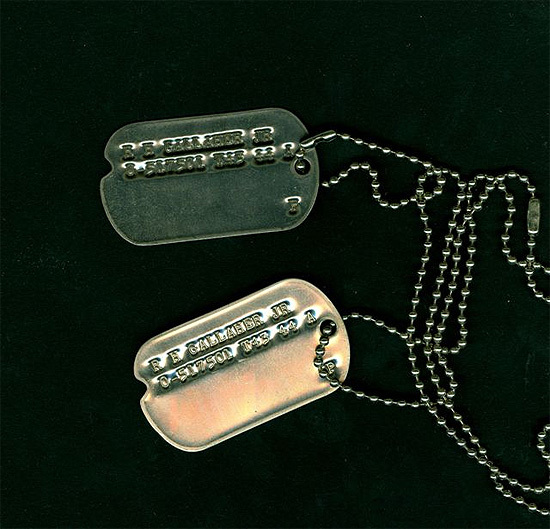 This particular sample consists of stainless steel links with hooks and catches to connect 2 Dog Tags, manufactured by Sweet Manufacturing Company, Attleboro, Massachusetts, U.S.A. Figure illustrating the Addressograph Model 70, pistol-type imprinting machine, Medical Department Item # 99387. Change # 3, General Order # 21, Headquarters A.E.F., 13 August 1917 > extension of wear of 2 Tags by Civilians attached to the A.E.F. The authors welcome any additional information covering issue of ‘special’ Dog Tags during World War 2. Contributors will receive the necessary credit and sources will be indicated. Thank you for your assistance. 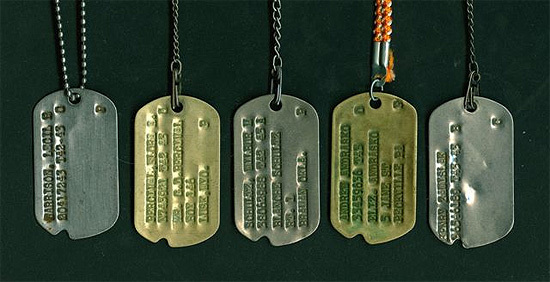 Grouping of “Dog Tags” illustrating different metal tags and types of necklaces.